Do USDA Loans Require Tax Returns? The USDA loan is one of the few loan options that offer 100% financing. You have to be a low to moderate-income family and you must buy a home in a USDA designated rural area in order to qualify. Finding a home in a rural area is pretty easy to figure out, but it’s the USDA income requirements that may make you stumble. The USDA income guidelines take into account the income of everyone over the age of 18 in your household. Even if the household members aren’t on the loan, they have to disclose their income. In the past few years, the USDA has gotten a little stricter with this requirement by requiring borrowers to supply their tax returns. It’s not the way you might think, though. Keep reading to find out how it works. You may not have to provide your copy of your tax returns to prove your household income, but the lender does have to request your IRS transcript. This means you and every household member will have to complete IRS Form 4506 T. This form gives the lender permission to access your IRS tax transcript. The tax return transcript shows the basic information about your tax return so that the lender can verify what you supplied is the truth. It is a summary of what you filed, but it also shows your adjusted gross income. The lender then uses this to verify that you provided the same information. If the information matches what you told the lender, the lender can then move forward processing your loan. Their first order of business is to make sure that you meet the income guidelines for your area. You cannot make more than the allotted amount for your family size and your area. In general, you can’t make more than 115% of the average income for the area. Once you know that you are eligible for the loan, you then have to prove that you qualify for it. Will you need your tax returns for this step too? It depends on the type of income you earn. Typically, if you are a salaried employee or you work full-time on an hourly salary, you won’t need to provide your tax returns for qualifying purposes. On the other hand, if you work on commission (more than 25% of your income is commission) or you own your own company, you will need to provide your tax returns. In this case, you’ll likely need to provide the tax returns for the last 2 years. This gives the lender the opportunity to average your income over that time. Why would a lender need two years of income? It’s because of the volatile nature of both commission income and self-employed income. When you don’t receive a salary, your income likely has ‘ups and downs.’ If the lender were to qualify you on your income when your income was ‘up,’ you might qualify for more mortgage than you can afford year-round. If the lender qualified you for a loan when your income was ‘down,’ they may short change you. Taking that 2-year average helps the lender know that you can afford the payment year round. The USDA loan provides 100% financing, as we discussed above. This means you don’t have to put any money down on the home, but you do have to cover the closing costs. The only way that you can roll the closing costs into your loan is if the house appraises for more than the amount you agreed to pay. If this is the case, you may be able to increase your loan amount to cover the closing costs. Keep in mind, that you’ll also pay mortgage insurance on the USDA loan. You will pay 1% of your loan amount at the closing (or rolled into your loan) and 0.35% of the outstanding balance each year, paid on a monthly basis. In other words, the lender takes the annual premium and divides it equally amongst your 12 monthly payments. You pay the insurance along with your mortgage payment. This insurance lasts for the life of the loan. In short, USDA loans do require tax returns, but typically not for qualifying for the loan. It’s more to prove your household’s eligibility for the 100% USDA loan program. The IRS transcripts are typically easy to obtain as long as you provide the proper form. If there is an issue and the lender cannot obtain them, you can request them yourself and provide them to the lender, if they request this of you. If you want to buy a rural home and you don’t have a down payment, you may want to explore your option for a USDA loan. Who can go wrong with 100% financing and low closing costs, right? It’s important to know that the USDA loans aren’t for everyone. First, you have to prove eligibility and then you have to prove that you qualify. While it sounds like a lot, there are only a few requirements that are hard and they pertain to the eligibility for the program. You should understand that the USDA loan is only for borrowers that have low to moderate household income. In other words, if you or someone in your household makes a lot more than the average income for the area, the USDA loan isn’t for you. It’s reserved for borrowers that would be unable to secure any other type of financing. That being said, the toughest USDA loan requirements are the property location and the total household income. You can use the USDA’s charts to determine where you fall within their requirements. In order to use USDA financing, you have to buy a home within the rural limits that the USDA set. Now what they consider rural and what most people consider rural are usually two different things. The USDA uses the most recent census tract to determine which areas are rural. While it doesn’t mean you will live in the middle of cornfields with no neighbors for miles, it does mean you’ll live outside of the city limits. If that’s not something you want to consider, the USDA loan wouldn’t be the right choice for you. As we discussed above, you need to be within the average income for your area in order to be eligible for the USDA program. This includes all incomes made from everyone in your household. If you have aunts, uncles, grandparents, or friends living with you – each adult income counts. If you have children that live with you, they will likely be worth a $480 deduction each. The USDA allows this deduction for each child under the age of 18 as well as each child over the age of 18, but that is a full-time student. If you have disabled relatives living with you, the USDA provides a $480 deduction for each disabled person living in your residence. If you have elderly parents or other relatives with you, the USDA allows a $400 deduction for each elderly person in your residence. The USDA will look at your monthly income based on the above figures to determine your eligibility income. If you don’t pass this step, you won’t move forward with the USDA loan. Keep in mind that you can’t apply for the loan with your entire household as co-borrowers. Typically, it’s just you and one other person, such as a spouse, on the loan. The other incomes in the house can help you pay the bills, but they don’t help with qualifying for the loan. While it sounds odd, a prepayment penalty is a charge you must pay if you pay your mortgage off early. The concept used to be commonplace in the mortgage industry, but today very few lenders still use it. Just in case you come across a lender that requires this type of penalty, you should know what it is to help you decide if you want the loan. Where do you Find the Prepayment Penalty? The best way to find out if you have a prepayment penalty is to ask the lender. Do this before you sign the loan documents in case you don’t want the loan any longer. You should also peruse your loan documents carefully. Lenders should disclose the prepayment penalty when they provide you with the Loan Estimate within three business days after applying for the loan. When in doubt, always ask. You don’t want to assume that there isn’t a prepayment penalty; that could be a costly mistake. Why is There a Prepayment Penalty? Some lenders use prepayment penalties to help ensure that they make a certain amount of money on your loan. For example, if you take out a 30-year loan, the lender is counting on making interest for those 30 years. If you pay the loan off in say 3 years, the lender will not make nearly what they thought they would when investing in you. Typically, prepayment penalties are only for the first few years of the mortgage. For example, you may see a prepayment penalty if you pay the loan off in 5 years or less. After that point, lenders don’t charge the penalty because many people sell their homes and pay off their loans after just 5 years. Charging you to pay the loan off early before the 5th year, though, encourages you to keep the loan or pay the penalty. Every lender charges a different amount for their penalty. It’s on a loan-by-loan basis. Typically, it’s referenced as a percentage of your loan amount. For example, if you have a $200,000 loan with a 3-year prepayment penalty at 3%, you would have to pay 3% off the current outstanding principal if you pay the loan off before 3 years. Let’s just assume your principal balance is $198,000. You would then pay a fee of $5,940 to pay the loan off early. This may not make much sense, especially since you’ll probably owe more than you make on the sale of your home this early in the game. Not every prepayment penalty means that you are penalized no matter how you pay off the loan. Some lenders grant exceptions for borrowers that sell their home, but not those that refinance. Lenders try to prevent you from refinancing by slapping on the prepayment penalty. It’s a way for the lender to keep your business by not allowing you to refinance without a charge. Ask about the fine print of the penalty even if you plan to keep the loan, though. Some lenders do allow you to make extra payments towards the principal, up to a certain point. The lender calculates how much they want to make on your loan and then maximize your prepayment penalty accordingly. The prepayment penalty is few and far between today, but it’s still a question worth asking. In some states, the prepayment penalty is illegal, so you won’t have to worry about it. But, in many states, it’s perfectly fine and many lenders still stick to it to make sure that they make enough money on your loan. Does an IRS Payment Plan Affect Your Ability to Buy a Home? Do you have a payment plan with the IRS because you couldn’t pay your taxes? You might think that it makes you ineligible to get a mortgage, but that may not be the case. Keep reading to learn how a payment plan may affect your ability to get a loan. We’ll get the bad news out of the way first – you can’t use a Fannie Mae loan if you have an IRS payment plan. They simply don’t allow it. But, if you have good enough credit to get a conventional loan, Freddie Mac loans do allow it, so it’s not a bid deal. Just because Fannie Mae doesn’t allow it, though, there are many other loan programs including all of the government-backed programs, such as FHA, VA, and USDA loans. The most important detail you should focus on is making your payments on time. The loan programs and lenders don’t focus on the fact that you have a payment arrangement. What they focus on is your payment history with the payment arrangement, just as they do for your other bills, such as house payments, credit cards, and personal loans. What most lenders want to see is on-time payments for the last 12 months. In other words, you have to wait to apply for the mortgage until you’ve made 12 payments and each of those payments must have been made on time. If you have a late payment within that timeframe, you’ll have to start all over again until you have 12 months in a row that you don’t have any late payments. Aside from the timely payments, you must prove that the debt fits into your debt ratio. Lenders need to make sure that you don’t exceed the debt ratios already set for each program. For example, if you want a conventional loan, you’ll need a debt ratio no higher than 36%. If you apply for an FHA loan, you can have a debt ratio as high as 41% and a VA loan allows a DTI as high as 43% in some cases. The lender needs to make sure that you can comfortably afford all of your debts including the new mortgage and the IRS payment arrangement. The debt ratio ensures that you have enough disposable income each month in order to cover the cost of living without having to sacrifice. A high down payment – The more money you invest in the home, the lower your chances of default become because you don’t want to lose your own investment. A high credit score – If you have a high credit score, it can offset the risk that your tax liability causes. A high credit score shows lenders that you are financially responsible and a low risk of default. A low debt ratio – Just because loan programs have maximum debt ratios, it doesn’t mean that you should max out your debts. The lower your debt ratio is, the lower your risk of default becomes, which makes it easier for you to qualify for the loan. The IRS payment plan can affect your ability to get a loan only if you don’t pay it on time or if it makes your debt ratio too high. Evaluate your income and debts to see if you can fit a mortgage payment into it while meeting the debt ratios discussed above. When Should You Review Your Mortgage? Just like you should review your insurance every year, you should review your mortgage annually as well. Your home is one of the largest investments in your lifetime. You want to make sure that you are making the most of your money when you pay it. Why should you look at your mortgage? Keep reading to find out the most common reasons. Your mortgage may have made sense for you at the time you took it, but what about now? Has anything in your life changed? Do you have a new job? Is your income different? Is your debt level the same or worse? These factors will determine what you should do about your mortgage today. For example, if your income fell, you may want to see if you can get a lower interest rate to knock your payment lower. If your debt increased, you may want to get that lower payment just to make your mortgage affordable. If your goals have changed and you are making more money, you may want to decrease your loan’s term. Maybe you want to own your home free and clear sooner than your current term allows. Refinancing into a shorter term can help you reach your goals. The market changes all of the time. Interest rates can change as often as every day or even multiple times a day. You may notice that rates are really dropping one day. That may make you want to go out and refinance your loan. Before you do, you should make sure that it makes sense. A refinance is going to cost you money. Those closing costs could take away from your savings. Make sure that you will save more in interest by decreasing your loan’s term than it would cost you in closing costs. Typically, it does pay off, but of course, it varies by lender. As you review your mortgage, you may find that you have a large amount of equity. Some people leave it untouched until they retire. They then use that money as a part of their retirement plan. Others see it and want to use it now. If you have equity in your home, you may want to make home renovations, consolidate debt, or even take a vacation. Some people use it as their child’s college fund and others leave it untouched. Every year, you can see where you stand with equity. Then you can decide what you want to do with it, if anything. If you pay Private Mortgage Insurance, you definitely want to review your mortgage every year. This way you can see where you stand. Has your home appreciated enough and your principal been paid down enough to get you below that 80% mark? If so, it’s time to eliminate your PMI. You have to request elimination of the PMI in writing. You’ll also have to pay for a new appraisal, but it will be well worth it if you can save several hundred dollars each month! Reviewing your mortgage once a year is a great way to stay on top of things. Whether you refinance or not, reviewing your mortgage to see where you stand financially is always a good idea. When Can you Eliminate Mortgage Insurance? Mortgage insurance is a fee you must pay if you have a government-backed loan (except the VA loan) or if you put less than 20% down on your conventional loan purchase. In some cases, mortgage insurance can add as much as a couple hundred dollars to your mortgage payment. Mortgage insurance is strictly coverage for the lender. If you were to default on your loan, the lender would have insurance coverage to get some of the money back that they lost on your defaulted loan. 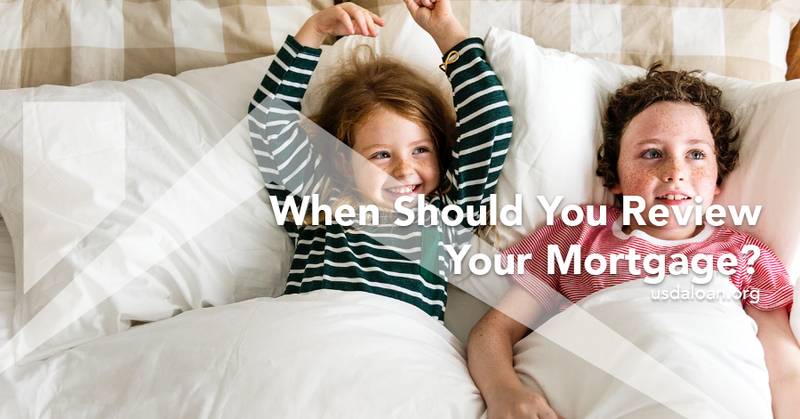 In some cases, you don’t have to pay mortgage insurance forever. Keep reading to see how you may be able to eliminate it. If you want to eliminate the PMI on your loan, you must request it in writing. You must also provide proof of the reason. For example, if your home appreciated, you can supply evidence of the comparable sales in your area. If you don’t request the elimination of the PMI, by law, your lender must eliminate your Private Mortgage Insurance when you owe 78% or less of the home’s value. FHA and USDA loans are both government-backed loans. In order to provide the guaranty that they provide, you must pay mortgage insurance. Unlike conventional loans, you cannot cancel the mortgage insurance on the FHA or USDA loan. You will pay the insurance for the life of the loan. Also unlike conventional loans, each borrower pays the same amount of mortgage insurance. On FHA loans, borrowers pay 0.85% of their average principal balance each year. The lender then breaks that premium up over 12 months, charging you 1/12th each month. On USDA loans, borrowers pay 0.35% of the average principal balance each year. Like FHA loans, you pay 1/12th of that amount each month. In addition to the annual mortgage insurance charged, both FHA and USDA loans also charge an upfront mortgage insurance fee. The FHA charges 1.75% as an upfront mortgage insurance fee and the USDA charges 1.0%. Each of these is a percentage of the loan amount and the fee is collected at the closing. Like we stated above, you pay the insurance for the life of the loan. This means even when you owe less than 80% of the home’s value, you still pay mortgage insurance. The only way to eliminate mortgage insurance on FHA or USDA loans is to refinance the loan. You’d have to refinance into a conventional loan with an LTV of 80% or less in order to avoid PMI. Because conventional loans have stricter requirements than FHA or USDA loans, you’ll need to make sure you qualify. If you took the FHA or USDA loan because you didn’t meet one of these requirements, you’ll have to work to improve your situation so that you do qualify. Once you pay off your USDA or FHA loan, you’ll eliminate the mortgage insurance once and for all. Paying mortgage insurance doesn’t have to be a bad thing as it does help you get the loan that you need. But after a while, you’ll want to eliminate it from your payment. If you can request elimination with a conventional loan, that is the easiest route, otherwise, you may have to refinance and pay closing costs to get a new loan. You hear that you can get a lower interest rate on your loan so you automatically think it’s worth it. Would it surprise you to know that sometimes refinancing isn’t all that it’s cracked up to be? Sure, you can save money and sometimes it’s a great thing to do. Other times, though, the process can be more of a headache and cost you more money than it’s worth. So how do you know when refinancing is right for you? Before you refinance, find out how much it will cost. Then you need to compare that cost to the savings you’ll earn. For example, let’s say you’ll save $50 a month, but the refinance will cost you $5,000. It will take you 100 months before you actually see that $50 savings because of how much the refinance cost you. Is it worth it? For the person that plans to live in the home for the long-term, maybe. After 8 years, he can start seeing the $50 savings, but even that’s a stretch. You can’t predict what you’ll be doing in 8 years. You don’t know if you’ll want to stay in the home or if you’ll even be able to stay. It’s best if you can recapture the savings within a matter of a few years. If it takes more than 3-4 years to pay off the costs of the refinance, it may not be worth it. Many people assume that to pay their loan off faster that they have to refinance their loan into a shorter term. That’s not the case, though. In fact, if you do so, you only make your loan more expensive, because again you have to pay the closing costs. There aren’t any rules that you have to follow to pay extra towards your principal, so you do what you can afford. If you know you have equity in your home, you may think it’s a good idea to take it out of your home. Refinancing with a cash-out refinance gives you access to this equity, but should you do it? The reason you need the money should determine this answer. If it has anything to do with the home itself, it can be a valid reason. For example, do you need a new roof or you want to add a room onto the home? The money you take out of the home will enhance the value of the home, which will provide you with the equity once again quite quickly. If you want the funds to take a vacation, pay off debt, or do anything non-home related, it may not be your best option. Remember, refinancing costs money, so you are paying to get access to your own money. Wouldn’t it be better to wait until you are ready to sell the home and you can have your funds in hand without paying thousands of dollars to get to it? If your financial situation, including your credit score, has changed since you bought the home, you may get worse terms now than you did then. If you want a lower interest rate, you’ll need great credit, a low debt ratio, and stable employment. If something changed in those areas, you may not be able to get the low rate that you anticipated. Even if you can refinance, it can be stressful, take a long time, and be expensive. You may be better off keeping the loan you have now and making the best of the situation. If you wanted to refinance to get cash, consider a personal loan or credit card. If you wanted to refinance to lower your interest rate, keep the rate you have and save the money on the closing costs. Refinancing typically only makes sense when you can recoup the closing costs in a short amount of time. Unless you need the funds to reinvest in your home, then it could be worth it too. Otherwise, you may want to leave well enough alone and not refinance so that you can save the thousands of dollars in closing costs and continue to pay your loan down as scheduled. Do You Have to Pay Higher Interest Rates on Jumbo Loans? Jumbo loans pose a higher risk to lenders. You borrow more money, which naturally makes you a higher risk. It doesn’t matter if you have great credit and low debt ratios, just the amount of your mortgage puts the lender at risk for default. Does this risk automatically give you a higher interest rate though? It really depends on each situation. Below we help you understand what lenders consider before giving you an interest rate on your jumbo loan. Most lenders sell their loans, with the exception of portfolio lenders. If you are a standard borrower with good credit and decent debt ratios, you won’t need portfolio lenders. If you use a lender that sells mortgages, your interest rate will depend on the demand. Are there investors out there waiting to buy your loan? Are there a lot of investors competing for the loans? If so, you have a better chance of securing a lower interest rate because investors want your business. If the demand in the market is low, meaning that there aren’t a lot of investors vying for your loan, the rates may be higher. Lenders need to make your loan enticing for investors to want it, which means they need to be able to make more money on it. If the demand is down, you’ll likely pay the higher interest rate. Now, the demand in the market doesn’t matter if you don’t have the good qualifying factors to back it up. Just like a conforming loan amount, lenders need to look at your individual risk of default. The riskier your loan profile, the higher the interest rate a lender will charge. You can expect the rate to get even higher if you need a jumbo loan amount. Maximize your credit score – It’s a good idea to start working on your credit score at least 12 months before you apply for a jumbo loan. Typically, jumbo loans require a higher credit score for you to qualify for it. But, the higher your credit score is, the lower the interest rate a lender can provide. Lenders base your interest rate on your risk of default and a high credit score can help decrease that risk. Lower your debt ratio – Another factor in your risk of default is your debt ratio. Your jumbo mortgage payment will likely take up a good portion of your income. If you have other outstanding debts on top of it, you put your risk of default higher than it would be if you didn’t have other debts. If you have the chance to pay off other debts or at least pay them down, you lower your risk of default, which may give you a lower interest rate. Choose the right loan type – Lenders base your risk of default on the type of loan you take too. If you choose an ARM loan, for example, you are a higher risk of default because your interest rate has the chance to increase over the life of the loan. The same is true for your loan term. If you choose the maximum loan term of 30 years, you put the lender at the greatest risk of default. If you borrow their money for less time, say 15 or 20 years, you lower that risk and therefore lower your interest rate. Increase your down payment – Another way to lower your interest rate is to increase your down payment or decrease your loan-to-value ratio. The lower your LTV, the less risk the lender faces of default. When you have your own money invested in the home, you are more likely to make your payments or you put your own money at risk. You have one more way to get the lower interest rate that you want. You can buy it down with what they call ‘discount points.’ This is a fee you pay at the closing in the form of a percentage of your loan amount. Most lenders will discount your interest rate 1/8th to 1/4th for every point that you pay. For example, on a $500,000 loan, one point would equal $5,000. Of course, this only makes sense to do if you will stay in the home for the long-term. If you know, you’ll move in the next five years or so, it doesn’t make sense to pay more money upfront. Lenders consider this money prepaid interest. They give you a lower interest rate over the life of the loan if you agree to pay it upfront. Getting the lowest interest rate on your jumbo loan is in your hands. The more work you do ahead of time to decrease your risk of default, the better interest rate you will get. Of course, you should also shop around to find the lender that will give you the best rate on your loan. Can You Buy a Fixer-Upper With a USDA Loan? You found the perfect fixer-upper, but you need USDA financing because of your low income and no money for a down payment. The USDA usually requires homes to pass their appraisal, which includes their minimum property requirements. Can you buy a fixer-upper with your USDA loan? You might be able to, but you must meet certain requirements. One of the USDA’s largest rules is that you must be able to live in the home while it’s being renovated. If the home is beyond inhabitable, you won’t be able to use USDA financing on it. While you live in the home, the work must be completed within six months. If the work will take more than six months, you can’t use USDA financing. What constitutes a livable home will vary by lender. Obviously, you need to be able to live in the home without fear of any dangers or obstacles making your daily life difficult. There cannot be the presence of things like lead paint or asbestos, as they don’t make for a livable home. If the home needs a major overhaul, you can count USDA financing out of the running. The home can only need minor renovations that cost no more than 10% of the loan amount. On a 150,000 loan, the renovations cannot cost more than $15,000. While this does limit the work you can do on a home, it still leaves you plenty of room for renovation. While knocking down walls or adding rooms might not be feasible, you may be able to do things like replace a deck, paint the exterior of the house, or put on a new roof, just as a few examples. Your lender will handle the payments to the licensed contractors working on your home. The contractors will have a contract that the lender will approve that will include a distribution of funds schedule. The contractor must then meet the dates on the contract in order to receive the funds. The lender will do a final inspection to ensure that the contractor did everything according to the agreement before they will release the final payment. You must also sign off on the work saying that it is satisfactory according to the agreement as well. Some lenders require you to have a contingency fund to make sure you have money should an emergency arise. It’s impossible for contractors to figure out everything that could go on when they renovate your home. If something comes up that will cost a lot of money to fix, you’ll need the contingency fund to rely on if you don’t have enough in the money borrowed for the home. A majority of the time, contractors are necessary to do the work on your home. If you are capable, though, you may be able to do the work yourself, but your lender must approve you to do so. In order to qualify, you must be able to prove not only that you have the knowledge to do the work, but also that you have the time to get it done within six months. The work that you do also cannot exceed 10% of the loan amount, just as is the case if a contractor does the work. The bottom line is that you can buy a fixer-upper with USDA financing, but it must be a minor fixer-upper. You can’t buy a home that is completely unlivable that needs thousands upon thousands of dollars of work. If you find a home that’s doable, but needs a facelift, though, it could be a good candidate for USDA financing. You know you need a good credit score to get favorable terms on your mortgage, but how do you do it? Most changes to your credit score take many months to take effect. Luckily, there are a few tips you can use to boost your credit score quicker. Keep reading to see how you can get your credit score higher today. One of the first things you should focus on is your credit utilization. This is the comparison of your outstanding revolving debt to your total credit balances. A good rule of thumb is to keep your credit utilization rate at or below 30%. This means that no more than 30% of your total credit balances should be outstanding. You have three credit cards each with a $1,000 credit limit. One credit card has a $250 balance, one has a $500 balance, and the other a $750 balance. Your total outstanding revolving debt is $1,500 and your total available balance is $3,000. That means your credit utilization rate is well above the 30% threshold. This could hurt your credit score more than you realize. Your credit utilization rate makes up 30% of your credit score. That’s a big percentage. If you are able to keep your credit utilization rate within the parameters spoke about above, you will have a better chance of your credit score improving quickly. Typically, as soon as you pay your credit card balances down and your credit card companies report it to the credit bureaus, your credit score will improve. If you don’t check your credit report often, you may not know if there is incorrect information reporting on it. You have access to one free credit report from each of the three credit bureaus every year. This means you could potentially check your credit reports for accuracy up to three times per year. We recommend that you take advantage of this. As you go through your credit report, you’ll see the information reported. If there are accounts that don’t belong to you on there, get to the bottom of the issue right away. You may have been a victim of identity theft or there could have been an honest mistake. Either way, get in touch with the credit bureau and the reporting credit card company to eliminate the account from your credit report. It’s best if you do this in writing. If there is other incorrect information on your credit report, such as a late payment you didn’t make late or a missed payment that you know you made, you’ll have to write to the credit bureaus for this too. In this case, you’ll need to provide evidence to the credit bureau why the information is incorrect. Any time you write to the credit bureau, they must investigate and respond to your request within 30 days with their findings. If they miss this deadline, the account must drop from your credit report according to the law. Any incorrect information that you have corrected can help increase your credit score quickly. If you have bad debt on your credit report, you can get ahead by arranging a payment arrangement with your creditor. The payment arrangement should then be reported to the credit bureaus. This way they know that you are paying your debt down and on time. Rather than showing that you have a late payment, the credit bureaus and potential lenders will see that you are making good on your debt. While this method won’t increase your credit score overnight, it will help your credit score increase slightly right away since the negative information won’t be on your credit report any longer. Of course, this only works if you stay on time with your payment arrangements. The final step you can use to increase your credit score quickly is to become an authorized user on a family member’s account. This only works if the credit card company reports the authorized user to the credit bureaus, though. You should only become an authorized user on a family member’s account that uses their credit card and pays the bill on time. You don’t want a large balance reporting in your name, as that will upset your utilization rate. But if you have a family member that uses their credit card and pays it off each month, the positive credit information can help your credit score. Improving your credit score doesn’t happen overnight, but it can happen quickly using any of the steps above. You can use one or multiple steps to help your credit score increase that much faster when you want to get a mortgage.